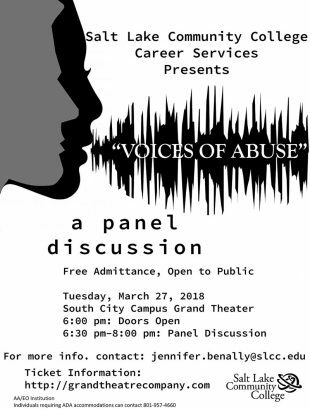 Five panelists and one moderator discussed the varied and highly nuanced issues of abuse during a discussion panel March 27 in the Grand Theatre at South City Campus. Many forms of abuse were represented on stage, from the ever-present sexual abuse to the more common, yet often thought of as less damaging, mental and emotional abuse. Terry Jackson-Mitchell, Lesa Bird, Samuel Owens, Lex Scott, and Sarah Johnson were the survivors chosen to represent and bravely speak on their stories. ABC4 evening news anchor Kim Fischer acted as moderator, guiding the discussion through many important points. Fischer, herself a survivor of sexual abuse, started the discussion by asking Johnson, a local social justice and civil rights activist as well as a survivor of mental and emotional abuse, about her definition of abuse. “It is a power structure … when it goes from bullying to actual abuse is when a person is exercising their power over you to keep you down in some way, to somehow try to convince you that you are not worthy in some way; that you don’t deserve help; that you cannot get away from this,” Johnson said. The panel seemed to agree with this definition and referred to it throughout the night. As abuse deals with victims feeling powerless, the panelists seemed most concerned with giving survivors their power back. Each one found their calling and passion, while empowering others in their own way. Owens, a local director and actor, fled home at about 17 or 18 years old. He awoke one morning with the growing realization of how bad things were living alone on the family farm in Samoa with his dad and feared what might happen if he didn’t do something. “I still have a scar on my foot from a .22 caliber. That’s how bad it was and I knew I was going to die there,” Owens said. Long after Owens escaped Samoa, he received news that he was going to become a father. Owens became anxious about the future and how his past relationship with his father might affect his child’s life. Owens described his path to becoming a director and actor in inspirational films. “How do I turn this into a positive thing, so my kid doesn’t have to see the same thing? And that’s when I started drawing, and photographing. I started creating images in my head,” Owens said. Bird, an administrative assistant with the Thayne Center for Service & Learning at Taylorsville Redwood Campus, described how she found herself playing out the cycle of abuse before realizing what was happening and quickly corrected the behavior by talking honestly with her children. In an email correspondence, Bird described the difficulty and power of such an experience. Fixing abusive situations and healing the resulting trauma is never easy, and there are often many hurdles that need crossing. Mitchell, a local realtor and SLCC alumna, referred to the “good ol’ boys club” — an informal system of norms and expectations that often offer protection by people in power to keep justice at bay. She told stories of sexual abuse in which the perpetrator was protected, and one particular instance may be the most notable. While preparing to testify as a witness to her friend’s murder in Liberty Park, Mitchell alleges she was raped by a Department of Justice attorney during meetings in which she was supposed to be prepped for the trial. She was 16 at the time. Mitchell is still trying to get due process for these instances, and has fought hard for justice. Though her efforts have not gone unnoticed, Richard W. Roberts — the attorney who later became a chief judge of the U.S. District Court for the District of Columbia — retired early with his full pension on grounds of an unspecified illness. In an email correspondence, Mitchell described the way in which members of the informal “boys club” protected her abuser. Mitchell described the ways in which her claims were undermined in this article on her last May. Mitchell also commented on recent bills that are meant to undermine cases like hers and the currently unfolding case of Mormon missionaries being raped during their time in the LDS Missionary Training Center. Fischer then turned to a subject that may be more important than justice: healing, and how it also may not be fully afforded without justice, as well as what you can do if you realize you are the victim of abuse. Bird spoke on this. “Although every situation is unique, it’s important to understand that the cycle of abuse is not. The abuse can be sexual, physical, or psychological, and can manifest mildly or blatantly,” Bird said. “Most abusers have come from abusive situations. You are not alone. What is unique is identifying the cycle and ending it; being strong for you and those you love. Loving yourself enough to move beyond it. Even with the evening being an overall success and small win for abuse justice and prevention, there remains a long road ahead of our communities, countries, and the world as a whole. If you are experiencing abuse or fear you may be perpetrating abuse, there are many great resources to begin healing. Mitchell, a self-identified poly-victim began her healing right here as SLCC.